My first print book entirely in Spanish! Escrito en español! Caminos de Fuego is a collection of two short stories of suspense and love. My short story, “Awakening from the Golden Sleep,” was recently translated into Spanish by Emilio Bernal-Zubieta of Monterrey, Mexico. The story describes the childhood of Ana Valdez, who grew up in Mazatlán, Mexico in the 1980’s and who, as an adult, became the President of Mexico in my novel, The Z Redemption. Intelligent, beautiful and mischievous, Ana is a protagonist you will never forget! Emilio also translated “Nightfire,” a story that explains the mystery of Día and Luna, two indigenous Tarahumara natives who were the grandparents of Corvette Nightfire in the novel of the same name. Inhabitants of the Copper Canyon in Chihuahua in northern Mexico, Día and Luna, married in adolescence, are seduced and later enslaved by men of the drug cartel who invaded their territory to grow marijuana and poppy. Caminos de Fuego is available in e-book form as well. Adrenaline stories of heroes, love, crime, aliens, poker and history by author and publisher, Daniel Wetta! Get a new entertainment addiction! Visit my author page on Amazon to see all the books! Sport’s Alien Fantasy Co-Authored by M. J. Scott and Daniel Wetta! Our novel spent 30 days on the Kindle Scout page by Amazon and garnered nearly 1,000 nominations for publication. Marilyn (M. J. Scott) and I believe that this story of a school teacher who must endure the ordeal of a grueling road trip in 1986 to determine if her memories of an alien childhood are real or crazy is set to make everyone question themselves when they make judgements about others. Inspired by the life of teacher Christa McAuliffe, who perished along with the other astronauts on that horrible day in that same year, Sport takes Christa with her to Thomas Jefferson’s Monticello during the Easter break of the students and teachers. It is the beginning of a journey into the unexpected, and it holds a mirror to the faces of people in rural Virginia in the time when our current orientation to a global community was just beginning. Sport has memories of multiple births. She remembers flights through space and vistas of vibrant silo cities in colorful, faraway lands. People she invents in imagination come alive. Her parents and educators think that she is crazy. That 1986 road trip is disastrous, and Sport, the cheerful school teacher, is refused help again and again. People gossip that she ages too slowly. Her admirers have questions to which Sport has no answers. But a child savant helps her understand her origins and destiny in Sport’s Alien Fantasy! Purchase our novel in print online from Amazon for $9.95 or the e-book for $3.99. The Amazon link is Click here to purchase! E-book is $3.99 and is exclusively with Amazon Kindle Direct Publishing. Kindle Direct subscribers may download for free. The link is Click here to purchase e-book! A Coup in Mexico, A Dance in Las Vegas: Heart-Clutching Excitement! Keep on the run in this cinematographic suspense novel through Mexico, Texas, and Washington in a story of high stakes and stirring love! To purchase the E-book at Barnes and Noble, Apple iBooks, Amazon, Kobo or Google Play, just click the book cover photo below! In this steamy and romantic suspense thriller based on true life events in Mexico, the author tells the story of ordinary heroes struggling to save lives in the midst of the drug cartel wars. With a military coup as backdrop, Ana Valdez, a Mexican homemaker and political opinion blogger, unwittingly becomes a celebrity of her nation. She and her gringo lover, ex-CIA agent David James, race time to prevent an American invasion and civil war in Mexico! The country dissolves into chaos when its Army sequesters its President and government and the anxious USA readies an invading force at the border. In Monterrey, Ana and David rally Mexico’s young people to form the paramilitary “Zs.” Trained to fight with parkour skills and without firearms, the Zs assist the Army in preserving public safety from attacks by the drug cartels. But when the cartels succeed in smuggling Mexico’s most strategic possession, bloodshed and invasion appear to be certain outcomes! Corvette and Valentina: Their one dance changes destiny in this cinematographic suspense novel that pits three men in a life or death fight for one woman! He is hot, 27, a new World Series of Poker celebrity, and clueless that his destiny will hurl him into a tsunami of danger fifty years in the making. The changes for him begin when a beautiful Mexican woman fleeing gunfire in a casino thrusts a bag loaded with cash into his arms and sprints away. His subsequent hunt for Valentina turns desperate as he becomes the hunted and time runs out for her life to be saved. He disappears from public view into the heinous underworld of the Zetas, where trafficking and kidnapping are ordinary lines of business. In the ruthless world of the cartels, Corvette and Valentina find that love is their only defense. Generations of family sins have forged Corvette’s character. Now he must reconcile the past with the harsh realities of his present. Set in Las Vegas, Barbados and Mexico, Corvette Nightfire, this second book in the suspense series, The Z Redemption Trilogy, takes up where The Z Redemption leaves off and straps the reader into another bumpy, exhilarating ride! 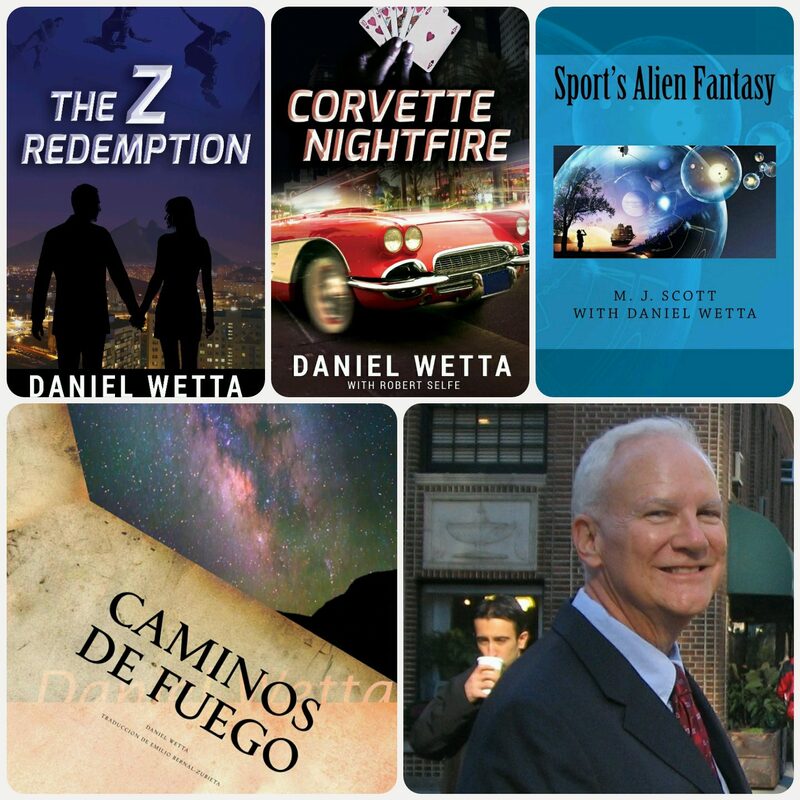 Six Titles by Daniel Wetta Available on Amazon! If you are a suspense thriller fan who likes sudden twists, passionate characters, flawed heroes and plots that push the red line, don’t miss these stories of intrigue! Plus, enjoy two stand-alone short stories that provide enriching details about the characters! Written in the same fast- paced style as the novels, the short stories take you to worlds you didn’t know existed! Try “Awakening From the Golden Sleep” and “Nightfire!” to whet your appetite! Click their e-book covers above to purchase on Amazon! Book Reviews of the Novels! Click the book covers below to read the reviews on Amazon! Click Photo Below to View or Print My Publishing Brochure! My affordable services include publishing , professional editing, formatting, book cover designs, website designs and marketing for authors and small businesses. Enter your email address in the white oval box in the menu on the left to follow my blog, learn about new authors and books, sales, and receive freebies!